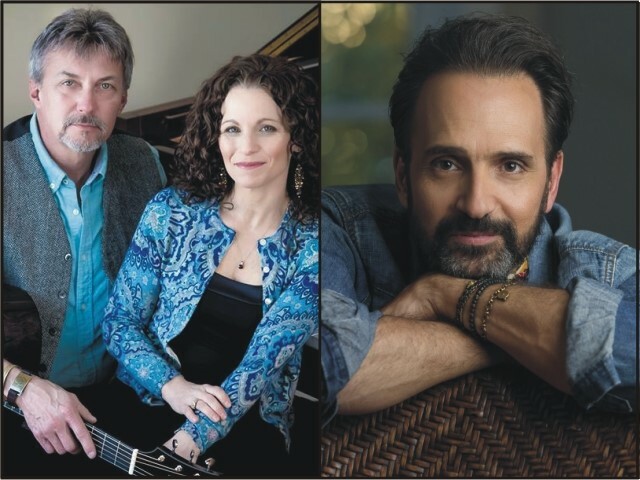 Award-winning songwriters Lipkin & Hitt and Eugene Ruffolo share a bill during the monthly Hard Luck Café series at the Cinema Arts Centre (423 Park Avenue, Huntington, NY) on Thursday, May 16. The 8:30 p.m. concert in the cinema’s Sky Room will be preceded by an open mic at 7:30 p.m. Tickets are $15 ($10 for Cinema Arts Centre and Folk Music Society of Huntington members) and will be available at the door. Lipkin & Hitt: Pittsburgh’s Jay Hitt, an acoustic guitar-playing troubadour, has teamed up with New York’s Lisa Lipkin, a truth-seeking piano songstress to craft a musical world that is insightful, tuneful, often playful, and sheer delight. Since their meeting in 2012, Lipkin & Hitt have graced all manner of stages and continue to enchant and entertain audiences wherever they go. Hitt — who has a talent for vivid storytelling, combined with crisp and delicate acoustic melodies — has twice been named Best Acoustic Musician by readers of the Pittsburgh City Paper and has received numerous songwriting awards. In addition to recording several albums and touring in support of them, his stage credits include Pittsburgh Light Opera productions of Always, Patsy Cline and Ring of Fire (a Johnny Cash revue). Lipkin’s songs have received such prizes as first place in a New York State Contest for Environmental Awareness and have been featured In the Tami Gold documentary, Passionate Politics. Her production credits include an award-winning children’s CD by Christine Pepe and Hitt’s Greetings from the Wilderness. Eugene Ruffolo, perhaps best known to LI audiences as part of the Cosmic Orchestra during the monthly Soulful Sundown series in Manhasset, is a prolific and deeply personal NYC-based singer-songwriter. A first-prize winner in both the prestigious Telluride Bluegrass and Merlefest songwriting competitions, he is currently working on his eighth studio album. His previous recordings have received worldwide critical acclaim. In addition to his original work, Ruffolo’s vocal talents, which a writer for Rolling Stone called “utterly intriguing,” have made him a favorite of many prominent artists with whom he has shared stages. Both in the studio and in live performance, he has worked with such diverse artists as Tony Bennett, Garth Brooks, Mary Chapin Carpenter, Kenny Loggins, Run DMC, Spyro Gyra, Livingston Taylor, Cheryl Wheeler, and David Wilcox. Ruffolo’s voice has been featured in numerous Hollywood films, and he has worked with noted director/producers Brian De Palma, George Lucas, Ennio Morricone, and Martin Scorcese.